Understanding the impacts of land degradation is, at least in part, limited by our ability to accurately characterize those impacts in space and time. While in recent decades remote sensing has offered unprecedented coverage of the land surface, the evaluation of remote sensing products is often limited or lacking altogether. In this chapter we use a survey-based approach to evaluate how well already existing remotely sensed datasets depict areas of land degradation. Ground-based surveys are compared to existing maps of land degradation and independent remote sensing datasets. This provides a metric of evaluation by using the commonly understood confusion-matrix. A representative set of case study countries was chosen after all countries were grouped using a k-means clustering approach (see Chap. 2). Survey sites within each country were sampled according to the intersection of agro-ecological zones, land cover, and the dataset to be evaluated. This two-tiered approach to sampling ensured a diversity of ground-truth surveys and therefore a robustness of results. Although ground-based surveys are resource and time-intensive, they provide information on both the evolution of the land cover and the drivers of land-cover change. Land degradation is a very complex process where diverse data are often needed for interpretation. Sustaining the biological or economic production capacity of land is vital to ensuring the well-being of all that depends on that land. Although it may seem to be a problem affecting only those with a vested interest in a relatively confined plot of land—such as subsistence farmers—land degradation also affects large swaths of land over longer timescales. 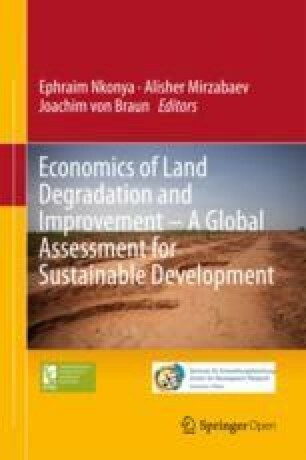 Land degradation has been defined as the persistent reduction of the production capacity of a land, which may be manifest through any combination of a number of interrelated processes, such as: soil erosion, deterioration of soil nutrients, loss of biodiversity, deforestation or declining vegetative health (Le et al. 2012). These various processes are considered as leading to land degradation assuming that ecosystem services are lost. Some processes such as deforestation act as enabling processes for degradation, such as soil fertility decline and biodiversity loss (Chap. 6). Land degradation may be either anthropogenic or natural, although this analysis is primarily focused on anthropogenic degradation. Furthermore, although a reduction of biodiversity is considered land degradation , the global scale of this analysis precluded the evaluation of such losses. As such, the working definition of land degradation used in the land degradation dataset produced by Le et al. (2014) focuses on primary production, such as changes in the productivity of the soil and biomass. Owing to the focus on terrestrial ecosystems, changes in quantity or quality of water resources is beyond the scope of this analysis. Without proper monitoring and evaluation of land degradation, not only is it difficult to assess the losses attributable to such degradation, but also it is difficult to develop practices and policies aimed at improving livelihoods. Monitoring land degradation, however, is more complex than it may seem as many degradation-inducing processes act on local scales but have regional to global implications. Monitoring and evaluation, therefore, cannot be limited to local evaluations if effective policies directed at reducing land degradation are to be developed. A global analysis identifying the extent and intensity of land degradation would be an invaluable tool for policy makers, and as such has been an active topic of research for nearly a decade. In this chapter we explore how global land degradation maps are formulated and evaluated using remote sensing and field-based observations. The need to monitor land degradation at regional to global scales in a consistent manner makes remote sensing an invaluable tool for doing so, however, products derived from remote sensing datasets may have systematic or structural errors that should be acknowledged and explored. Failure to do so will likely lead to overconfidence or misuse of remote sensing-based estimates of land degradation . These structural errors may be conceptualized as falling into one of three related categories: errors arising from the type of sensor used, errors arising from the spatial and temporal resolution of the analysis, and errors arising from the derived data used (i.e. indices, land cover/land use classifications, etc.). Most global-scale analyses have used the Normalized Difference Vegetation Index (NDVI ), which is a measure of vegetative health derived from the difference in the intensity of near-infrared wavelengths and that of visible wavelengths (Huete et al. 1999). In effect, NDVI quantifies the photosynthetic capacity of a given pixel. The type of sensor used to gather measurements is important because it dictates the type of information returned, and under what conditions that information is returned. Sensors used to measure NDVI, for example, require clear-sky conditions as they are not cloud penetrating. This has serious implications for available sampling frequency during the rainy season in habitually cloudy environments. Most curated datasets will screen out cloud cover or systematically sample for clear-sky images, but this means that seasonal consistency is difficult to maintain when comparing images from different years. The specific sensor chosen will ultimately dictate the temporal frequency and spatial resolution of the data. Already compiled NDVI datasets are available at a broad range of time scales (1975-present) and resolutions (30 m–8 km). Issues of differing timeframes and resolutions pose a serious challenge to analyses attempting to combine or compare datasets, although past studies have shown that these challenges are not insurmountable. After comparing five different NDVI datasets—including products derived from the Moderate Resolution Imaging Spectroradiometer (MODIS ), Advanced Very High Resolution Radiometer (AVHRR ), and Landsat satellite sensors—over 13 sample sites, Brown et al. (2006) noted that although the sensors differed significantly, “the NDVI anomalies exhibited similar variances”. The authors concluded that despite differences in the absolute values or time series of each product, comparisons of anomalies/trends between datasets is still valuable. More recently, Fensholt and Proud (2012) found that when NDVI data from MODIS is resampled to the resolution of AVHRR, the two datasets compare favorably over the global land surface. Similarly, Beck et al. (2011) compared Landsat NDVI measurements to those from four separate AVHRR-derived products, and to MODIS NDVI. The resulting correlations compare favorably, ranging from 0.87 to 0.90 (Beck et al. 2011). While challenges posed by specific NDVI products may be overcome using a combination of datasets, the index as a whole has noted limitations in its use for measuring land degradation. Most notably, NDVI asymptotically saturates in high biomass areas when compared to indices such as the Enhanced Vegetation Index, and may therefore be a poor indicator of vegetative health over dense canopies (Huete et al. 2002). The high-biomass saturation of NDVI makes it a poor indicator of thinning in forests, meaning that as an index of land degradation NDVI may overlook certain forms of deforestation. Furthermore, NDVI cannot distinguish between categories of land degradation nor can it provide information on some types of land degradation , such as loss of biodiversity or soil erosion. In fact, if invasive species grow densely, the result will be in an increase in NDVI, which is often understood as an indication of land improvement. Compounding the complexity of using NDVI as a measure of land degradation is that land degradation may be driven by either natural or anthropogenic forces, which is a distinction that is often impossible to make using NDVI alone. And while many studies are interested in anthropogenic land degradation, most changes to net primary production (a measure closely related to NDVI) over the last decade have been naturally occurring (Zhao and Running 2010). Although this adds to the complexity of developing datasets focusing on anthropogenic degradation, it does not make the task intractable. Indeed, researchers have already developed numerous remote sensing derived datasets that identify individual components of anthropogenic land degradation: declining vegetative health (Huete et al. 2002), crop yields (Iizumi et al. 2014), deforestation (Hansen et al. 2010, 2013), declining water supplies including groundwater depletion (Voss et al. 2013), and even a partial proxy for soil salinity (Lobell et al. 2009). The Food and Agriculture Organization (FAO) attempted to move beyond individual components and produce more inclusive estimates of land degradation at a global scale, based at least in part, on remote sensing products in its Global Assessment of Land Degradation and Improvement (GLADA) project. As part of the project, Bai et al. (2008) proposed several methods of measuring land degradation at a global scale based entirely on remote sensing products. The Global Land Degradation Information System (GLADIS), which also relates to the GLADA framework, builds upon the analysis of Bai and Dent (2009) by modifying their product before incorporating it into a database that assesses the current capacity of and trends in the ecosystem services of land. While the accuracy of these products are debated, they are generally recognized as an important first step towards globally consistent estimates of land degradation (Wessels 2009). In this chapter we use both remote sensing and survey-based datasets to analyze and evaluate an updated methodology for producing global estimates of land degradation, which was produced by Le et al. (2014). Although the coarse resolution and global coverage of the land degradation dataset precludes a complete, in-depth evaluation of the dataset, we present a robust method of evaluation that incorporates multiple regions and spatial scales by making use of a diverse collection of datasets. In the following sections we present the datasets used, the methods of analysis, and the results. We conclude with a brief discussion of the implications of these results for global land degradation mapping. Independent datasets and previous estimates both play an important role in our evaluation of the new land degradation map produced by Le et al. (2014): the former identifies potential errors associated with input data while the latter is used as an independent estimate, which provides an independent perspective arrived at using alternative methodologies. In this analysis we compare the Le et al. (2014) map to the soil and biomass components of the GLADIS database as a reference to past efforts aimed at mapping terrestrial anthropogenic land degradation. The GLADIS database as a whole contains information at a resolution of five arc minutes for six distinct categories: biomass, soil, water, biodiversity, economic, and social (Nachtergaele et al. 2010). The biomass components of GLADIS are based on the work of Bai and Dent (2009), which uses NDVI and rainfall to estimate land degradation. Bai and Dent derive trends in net primary productivity (NPP) from NDVI and establish areas of degradation by overlaying an index of rain use efficiency, which is calculated using time series information on rainfall and NDVI (Chap. 4; Le et al. 2014). While many remote sensing datasets either lack ground-based evaluation entirely or provide few details on such analyses, the GLADIS framework conducted and documented extensive ground based evaluations over South Africa. The GLADIS evaluation is particularly relevant because the dataset being evaluated is of a similar scale as the dataset used in our analysis. In their analysis, Bai and Dent performed field evaluation of 165 sites in South Africa using point estimates and circular areas with an 8 km radius as a means of accounting for errors in geolocation. The authors found agreement between the land degradation status map and the field sites to be 33 % for the point estimates and 48 % for the area-based estimates. A number of problems pervaded the satellite based estimates. In terms of removing the climate influence, the rainfall-corrected trends still displayed a systematic relation with climatic conditions. Specific land uses proved difficult throughout the analysis. Cultivated land, for example, was often classified as degraded owing to management practices such as crop rotation or fallowing fields. Areas with sparse vegetation also proved difficult to correctly classify. These areas were often identified as improved in the satellite dataset when, in fact, they were among the most degraded lands due to over-grazing and heavy erosion (Bai and Dent 2008). Systematic errors inevitably manifest themselves as well: the presence of dense vegetation considered a weed showed up as land improvement in the remote sensing dataset. The source of some errors could not be identified, as was the case for a number of areas indicated as degraded in the remote sensing dataset but showing no indication of such from the ground. Issues of resolution also proved problematic when deforestation and heavy erosion was undetected in the remote sensing analysis due to the coarse resolution of the dataset. Ultimately, the authors concluded that the GLADIS dataset may not be used as a proxy for land degradation, but is never-the-less valuable as an indicator map to be used as a guide to further explore potentially degraded areas. The Le et al. (2014) land degradation dataset evaluated in this analysis builds upon the GLADIS methodology and recommendations. The dataset is a global study that aims to identify “geographic degradation hotspots ”, meaning regions where degradation magnitude and extent is relatively large (Le, submitted). As such, this dataset is intended to be used as a guide for prioritizing investments and further in-depth studies at regional scales rather than a final map of land degradation. The dataset uses the Global Inventory Modeling and Mapping Studies (GIMMS) NDVI dataset, which is derived from data collected by AVHRR ), to calculate statistically significant long-term trends in NDVI from 1982 to 2006. The effects of rainfall are removed by correlating the NDVI with precipitation estimates from CRU v3.1 (Harris et al. 2014), and masking out any areas with significant correlation from further analysis. The dataset further corrects for atmospheric fertilization-dominated dynamics in areas without significant rainfall-NDVI correlations by dividing the unpopulated land surface of the earth according to aridity class and land cover before identifying the mean NDVI trend in each class. These mean trends are considered the atmospheric fertilization driven dynamics, and are removed from each NDVI time-series within each class. The dataset also addressed some of the structural issues with NDVI by identifying areas of saturated NDVI, a common problem in densely vegetated regions. A leaf area index of four was used as the threshold at which NDVI trends were considered unreliable and were screened out. Le proposes that the remaining pixels indicate anthropogenic trends in biomass productivity excluding areas with rainfall-driven dynamics, corrected for atmospheric-fertilization and with unreliable NDVI trends removed. The dataset represents significant progress towards overcoming the many limitations to measuring anthropogenic land degradation at a global scale (Chap. 4; Le et al. 2014). A comparison of the Le et al. (2014) dataset to the previously developed GLADIS database will prove useful, but would be incomplete due to interdependencies of the two products. Interdependencies of the two products arise due to the lack of multiple, independent datasets of NDVI on a global scale during the 1980s and 1990s. Only the AVHRR satellite sensor provides a global, continuous time-series of NDVI data dating back to the 1980s. This sensor therefore provides the foundation of nearly all long-term, continuous estimates of land degradation including those developed by Bai and Dent (2009) for the GLADIS framework and the reconstruction of historical yields by Iizumi et al. (2014). In particular, each of these analyses use the GIMMS NDVI dataset. We therefore choose to use Landsat measurements of NDVI and MODIS estimates of land cover as independent datasets to evaluate the data-specific errors while the ground-based samples from field surveys are used to assess physical processes occurring on the ground that may be missed by the remote sensing estimates. This approach allows us to separately evaluate the inconsistencies relating to datasets—an important aspect given that the GIMMS NDVI dataset has a coarse spatial resolution of approximately 8 km—and those relating to the methods of correcting for atmospheric fertilization , NDVI adjustments and rainfall-dominated dynamics. Although AVHRR data is the only global dataset dating back to the 1980s that provides a continuous time series, the Global Land Survey (GLS) Landsat dataset provides NDVI estimates with near-global coverage for the years 1975, 1990, 2000, 2005 and 2010. Table 5.1 provides an overview of the GLS datasets used in this analysis, including the Landsat sensors used to collect the images for each dataset. In many cases multiple sensors were used since the GLS Landsat datasets provide NDVI estimates around a target year, rather than for a specific date. This is necessary because the effective return time for cloud free images—or images with minimal cloud cover—is dependent on both the season and region being observed. As may be expected, coverage is greater in the dry season and over arid areas when compared to the tropics or to rainy seasons. The Landsat sensors have a return interval of 16 days, meaning that they take images of the same spot every 16 days, but that data must be downloaded and stored in order for it to become available for analysis. In practice, it takes many years of available data, often spanning more than a decade, to create global coverage. Figure 5.1 illustrates the histogram of image acquisition dates. Neither the 1975 nor the 1990 dataset provides an ideal fit to the GIMMS NDVI start date of 1981: the GLS 1975 contains only a few images after the 1980s and in fact has a skewed distribution of images towards those prior to 1975. GLS 1990 contains images nearly a full decade after the GIMMS start date, but has a more normal distribution such that the majority of images acquired for the dataset are fewer than 5 years away from the GIMMS start date. By contrast those images obtained for the 2000 and 2005 datasets were drawn from a relatively small number of years. The images for the GLS 2000 dataset came from just 4 years, with the majority drawn from 2000 or 2001. With the exception of a negligible number of images drawn from 1989, presumably to fill spatial gaps in the coverage, the GLS 2005 dataset was also drawn almost entirely from four years with the majority of images coming from 2005 and 2006. While the GLS Landsat dataset provides information at a finer spatial resolution dating back further than would be available with the MODIS sensor, which begins coverage in 2000 at a spatial resolution of 250 m up to 1 km, the Landsat dataset is not without its problems. Owing to the variability of acquisition dates (both annual and seasonal), the observed changes in NDVI may reflect a degree of seasonality in areas where seasonal consistency could not be obtained. This problem will be particularly pronounced in transitional zones that demonstrate relatively greater variability in seasonal vegetation cover. Despite this limitation, the GLS Landsat datasets have proven to be preferable to alternative data sources covering comparable time periods, such as GeoCover (Townshend 2012). MODIS data, although only available beginning in 2001, are a valuable source of information as independent, global estimates of both land cover and NDVI. For this analysis the land cover information was chosen to provide estimates to be compared to the FGD (focus group discussion) survey results, which estimate land-cover changes from 2000 to 2006 as a measure of recent degradation trends . Collection 5 of the MODIS land cover type dataset (MCD12Q1) was used, which provided land cover information at a 500 m spatial resolution annually (Friedl et al. 2010). Input datasets used in the classification procedure include information from MODIS bands 1–7, the enhanced vegetation index, land surface temperature, and nadir BRDF-adjusted reflectance data. The data are produced using an ensemble supervised classification algorithm, which employs a decision tree model structure and uses boosting to estimate the classifications. The classification process includes techniques for stabilizing year-to-year variations in land cover labels not associated with land-cover change. As a means of evaluating the overall accuracy of the dataset, it is ground-truthed using 1860 sites distributed across Earth’s land areas (see Fig. 2 in Friedl et al. 2010), sampled with reference to adequate coverage of a range of geographic and ecological variability using a layer of ecoregions. The overall accuracy of the product is about 75 %, although the performance of each class varies considerably. FGD surveys were used as a complement to the remote-sensing based observations, which provide great volumes of information but are limited in the physical processes they can measure. These surveys provide ground-based estimates of land degradation from the perspectives of the communities involved. In Senegal and Niger, communities were selected by intersecting the Le Land Degradation map (submitted), Global Land Cover 2000 v1, and the global environmental stratification (GEnS) datasets as a means of sampling both degraded and improved pixels across a range of agro-ecological zones. Figure 5.2 depicts the datasets used to determine sampling criteria for these countries. The Le et al. (2014) dataset identifies both areas of degraded pixels as well as areas of improved pixels. Improved pixels represent areas of increased vegetation (Chap. 4; Le et al. 2014) In addition to Senegal and Niger, communities were also chosen for India , Uzbekistan , Tanzania , and Ethiopia . The study sites within these countries differ in that they were not chosen to represent degraded and improved areas of the Le et al. (2014) dataset but rather areas that were most successful for conducting interviews with local stakeholders. For all six countries, communities were chosen so people surveyed would have knowledge of a surrounding land spanning an area of 8 km × 8 km, which is the size of a single pixel in the Le et al. (2014) dataset. Individual participants were selected such that community leaders, women, cultural leaders, and a diversity of occupations as well as ages were present. These selection criteria ensured that a broad variety of land users would be present, particularly those with intimate knowledge of past land use developments. Information elicited in the survey includes estimates of the severity and drivers of many land degrading processes, such as; the land cover for the area surrounding the community in 2000 and 2006, the deforestation occurring during that time, changes in cropping intensity, and changes in crop yields. This information was elicited using a variety of techniques, including relative questions (i.e. were yields this year higher or lower than five years ago), collaborative map making, and GPS coordinates taken by the surveyor. The design of our evaluation analysis builds upon established methods and previous studies in an effort to complement the in-depth insight from ground-based evaluation techniques with the near-ubiquitous coverage of remote sensing estimates. We first compare the new estimates of land degradation to the methods and results of previous products as a means of identifying systematic similarities and differences. In the comparative analysis we identify overlapping input datasets and methods as well as key differences. This analysis, while not an evaluation of accuracy, provides context crucial for the accuracy evaluation analysis. As described previously in the data section, the sites used to evaluate the accuracy of the land degradation map in Senegal and Niger, are selected within a framework that maximizes selection of appropriately sized degraded and improved sites within a range of agro-ecological zones for each case study country. In India , Uzbekistan, Tanzania, and Ethiopia, these sites were chosen randomly. The processes of land degradation or improvement are identified and analyzed at each site using FGDs conducted with the communities as well as a number of remote sensing-based analyses. The FGD questions are synthesized into five major categories for this portion of our analysis: (1) changes in land cover, (2) deforestation, (3) crop intensity/yield changes, (4) community perception of trends in land degradation/improvement, and (5) processes that would be unobservable using remote sensing . Each of these categories are designed to elicit, either directly or indirectly, the presence or absence of land degradation and the associated impacts . Unfortunately surveys in India, Uzbekistan, Tanzania , and Ethiopia did not contain information relating to numbers 4 and 5 above. These surveys were conducted by independent researchers. The benefit of using survey information from these study sites is to see how randomly chosen areas agree or disagree with remote sensing datasets. The immediately visible forms of potential land degradation—deforestation, land clearing, etc.—are relatively easy to identify using remote sensing. The strength of the field survey is in identifying attributes that may not be immediately visible using satellite sensors such as changes in forest productivity through selective logging, erosion, salinization, or nutrient depletion leading to decreased crop yields. The field surveys also provide robust information that is not confounded by complex surface processes such as invasive species acting to increase vegetative cover or systematic fallowing of crop fields, both of which would lead to erroneous remote sensing assessments. The limitation of the FGDs, however, is the time frame available. Community members cannot be expected to remember specifics of land cover, yields, or cropping intensity as far back as three decades, so those questions are limited to the years since 2000. More general questions do elicit information on land degradation dating back to 1982, but do not gather information in the same manner as the specific questions designed to identify those physical processes on which the land degradation map is based. The first three categories of FGD questions (changes in land cover, cropping intensity and yields, and deforestation) are designed to allow direct comparison to available remote sensing estimates in our analysis. This direct comparison isolates reliability of remote sensing estimates of land degrading processes without the complication of differing time frames or unobservable processes. Building on established methods and those proposed by Bai and Dent in their evaluation of the GLADIS framework, we conduct the remote sensing analyses using a buffer radius of 8 km around each site as a means of approximating the resolution of the land degradation dataset as well as to account for errors in geo-location. Each remote sensing analysis consists of three parts: an analysis of the change in Landsat NDVI from 2000 to 2005, an accounting of changes in MODIS land cover from 2001 to 2006, and an assessment of trends in Landsat NDVI using GLS data from 1975, 1990, 2000 and 2005. The analysis of changes in NDVI from 2000 to 2005 using the Landsat GLS datasets allows for a direct comparison to the field based survey, which asks participants about deforestation, and changes in land cover over the same time period. In this case, NDVI is averaged annually and compared across a five year time period. A decrease in NDVI is considered degradation and an increase improvement. The changes in land cover from the survey can be further corroborated against the MODIS land use/cover change analysis. A qualitative ordinal ranking of total economic value was used as a guideline to assess whether observed land-cover changes constituted degradation or improvement. For example, the removal of forest or shrubland to plant crops, is recorded as degradation, since this process often leads to erosion, a loss of nutrients in the soil, and other longer term issues. The long term trends in vegetation health/cover can be assessed using the Landsat trend analysis, which has a timeframe comparable to that of the GIMMS NDVI trend analysis at the heart of the land degradation map. Improvement is recorded when, during most of the time period NDVI is increasing, degradation is recorded when the opposite occurs. In all cases, if there was both degradation and improvement, it was analyzed which influence was more widespread. See Figures 5.3 and 5.4 for examples of the data collected for two of the survey sites in Senegal used in the remote sensing analyses. A comparison between the Le et al. (2014) land degradation dataset and aspects of the GLADIS land degradation database serves as a useful benchmark. While the Le et al. (2014) dataset provides only one map indicating whether areas are degraded or improved and is based entirely on terrestrial processes, the GLADIS database provides estimates for multiple categories of land degradation, including biomass, biodiversity, soil, water, economic, and social. For this comparison the biomass categories were considered most relevant. Table 5.2 illustrates the input data used in the Le et al. (2014) land degradation map as compared to the GLADIS biomass analyses. Although both land degradation maps rely on the GIMMS NDVI and CIESIN-CIAT population datasets, each incorporates independent ancillary information using different methods such that the two datasets may be considered separate, if not independent, estimates of land degradation processes. Figure 5.5 demonstrates the comparison between the Le map and the GLADIS trends in NDVI, which are identified as being anthropogenic or natural, trends in total biomass, and trends in soil degradation or improvement. The terrestrial biomass-based datasets (panels a–c) largely agree over Canada, Northern Argentina , Democratic Republic of the Congo, Angola, Tanzania , Mozambique, Malawi, India, Kazakhstan , the majority of Southeast Asia, and Australia. However, they disagree over most of the US, Europe, much of Brazil, the Sahel, South Africa, China and portions of Russia. In general, the GLADIS datasets indicates larger areas of land improvement , arising from both natural and anthropogenic influences. Without extensive ground-based measurements it is difficult to evaluate which dataset is more accurate in the areas of disagreement, but the regions of good agreement lends confidence to both datasets in these regions. While the GLADIS estimates of soil degradation or improvement have no direct analog to the Le dataset, the comparison between the two is useful as it may elaborate the extent to which the Le dataset captures soil degradation processes (Fig. 5.5d). The GLADIS soil degradation map (panel d) shows little resemblance to the Le land degradation data. Le et al. (2014) does develop an additional dataset identifying areas in which excessive fertilizer application may mask land degradation (data not shown), which produces similar patterns to the GLADIS map over China, Northeast India and much of Europe. The comparison of soil degradation products reveals that the Le et al. (2014) data and the GLADIS data capture some similar soil processes in parts of Europe and Asia, but diverge widely in most other regions indicating a high level of uncertainty. These dissimilarities are to be expected provided the difficulty of measuring processes of soil degradation on global scales. In addition to considering existing land degradation maps, it is important to use independent datasets to evaluate new estimates of land degradation. The results of the survey-based analysis and the remote sensing analyses provide useful insight into the value of the Le et al. (2014) land degradation dataset, and of the scale-dependent processes involved in the construction of the dataset. A total of 6 countries were analyzed to compare remote sensing analyses with survey results for selected sites. The sites represent a range of agro-ecological zones, and include both areas indicated as degraded and improved in the Le et al. (2014) dataset. Figure 5.6 illustrates the seven sample sites chosen for the evaluation analysis in Senegal . A comparison between the focus group discussions conducted at each site and the remote sensing analyses indicate a high level of agreement (3.5/4 or 4/4) for four sites, a moderate level of agreement (3/4 or 2.5/4) for two sites and no agreement (2/4) for one site, as indicated in Table 5.3. The sites that demonstrated unanimous, or near unanimous, consensus on the state of land degradation had a number of systematic similarities. Out of the four sites with a high level of agreement, three were degraded (Bantanto, Gomone, and Niassene) and one was improved (Diakha Madina). These sites all experienced clear areas of deforestation, or reforestation in the case of Diakha Madina, which was captured in the FGD , the Landsat analysis, and the MODIS analyses (see Table 5.4 for a summary of FGD results and Table 5.5 for a summary of the remote sensing results). While there are land degrading processes that were not captured in the remote sensing analysis—such as wind/water erosion and salinization—occurring at each of the degraded sites, the remote sensing analysis already correctly categorized these sites due to the clear decrease in vegetative health. The inability of remote sensing products to capture erosion or salinization processes, however, became relevant for the improving sample site. The results of the focus group discussion at Diakha Madina, the improved site, revealed that the narrative of land improvement is somewhat undercut by factors not captured in the remote sensing analysis, particularly a decrease in crop yields due to erosion. Figure 5.3 depicts the remote sensing analysis for Niassene as an example of the data provided by such analyses. The sample sites that demonstrated intermediate agreement, Guiro Yoro Mandou and Missira, also contain systematic similarities in that both sites demonstrated a dynamic of cultivation that the remote sensing analysis was unable to capture (see Guiro Yoro Mandou and Missira in Tables 5.4 and 5.5). In Guiro Yoro Mandou the MODIS analysis indicates an increase in wooded cover in some areas and a loss of natural vegetation in other areas due to cropland expansion. However, the FGD results clarify that this site has seen considerable planting of mango and cashew trees. The site is therefore clearly degraded due to expanding croplands, declining yields, and loss of natural vegetation, but the remote sensing estimates have difficulty capturing these dynamics due to the tree-crops planted. In Missira, on the other hand, the MODIS and FGD analysis agree on a decrease in forested area, but show opposite trends in cropland : MODIS indicates a loss while the FGD indicates increased cropland extent. This difference is likely due to patterns of fallowing and regeneration, as indicated by the FGD. This same pattern of regenerating fallowed fields may account, at least in part, for the demonstrated increases in NDVI measured by Landsat. There may, in fact, be a number of competing processes at work as increasing cropland area is causing deforestation, but regeneration of fallowed fields is increasing natural vegetation cover. Similarly the site has experienced water erosion and a perceived decrease in crop values but also reports an increased yields in recent years. In Talibdji, the site that demonstrated the lowest level of agreement, uncertainties in the remote sensing dataset compound with dynamic local processes to confound agreement on the status of the site (see Talibdji in Tables 5.4 and 5.5). The long-term NDVI trend for Talibdji showed no coherent pattern, although it demonstrated degradation in recent years (2000–2005). Figure 5.4 demonstrates the data derived from the remote sensing analysis for Talibdji. The GLS Landsat data showed no coherent trend for NDVI, MODIS land cover showed many shifts in cropland extent in both directions, while the FGD indicated stable cropland. These discrepancies likely indicate a system of fallowing or rotating fields that is not captured well in the remote sensing analyses. The FGD and MODIS analyses also disagree on wooded cover, which is likely because the MODIS land cover classes that dominate Talibdji have poor user accuracy (many below 50 %, see Table 5.6), meaning that misclassifications are likely (Friedl et al. 2010). The FGD, meanwhile, revealed that erosion has decreased yields and therefore the value of crops, which would not have shown up in the NDVI analysis. In addition to Senegal , six sites were chosen in Niger to compare the FGD and remote sensing results. Only two of the sites chosen have FGD results due to data collecting issues. Sites containing only remote sensing data were still analyzed to see whether agreements existed. Figure 5.7 illustrates the six sites chosen, which have a range of agro-ecological zones, and include both areas of degraded and improved land from the Le et al. (2014) dataset. Of the two sites with FGD results, Tiguey had high agreement (3.5/4) and Koné Béri had low agreement (2/4). Out of the four sites without FGD results, three showed a moderate to high level of agreement between the remote sensing datasets (2/3–3/3) and one showed a high level of disagreement (0/3), as shown in Table 5.7. Similar to the Senegal results, sites showing a high level of agreement were mostly degraded. Tiguey for example, one of the two sites with FGD results, showed a conversion of grassland to cropland in the MODIS analysis and a recent decrease in NDVI (although historically NDVI increased from 1975 to 2000) (Table 5.9). Another change contributing to degradation was deforestation indicated by both the MODIS and FGD data (Table 5.8). Sites showing a moderate to high level of agreement without FGD results are Babaye, Bazaga, and Béla Bérim, all of which are mostly degraded. Béla Bérim showed 100 % agreement. The MODIS results indicate a decrease in wooden cover here where conversion to grassland is occurring. Babaye and Bazaga had somewhat mixed results, and without the FGD results it is more difficult to interpret what is actually occurring. Two sites showed less agreement, Ndjibri with 0/3 agreement and Koné Béri with 2/4 agreement. The FGD results indicate that Koné Béri had a decrease in crop land but an increase in shrub land and bare soil. Results also showed a severe forest loss and an increase in cropping intensity but a decrease in yields. Another issue that the FGD results showed was water erosion, which would not be an observable change viewed by remote sensing . MODIS land-cover changes and NDVI however show an increase in vegetation. MODIS shows a slight increase in forest area and a change from barren to grassland. Landsat NDVI trends show a recent increase. In addition to Niger and Senegal , study sites within the countries of India , Uzbekistan , Tanzania, and Ethiopia were chosen to compare survey results with remote sensing datasets. The study sites within these countries differ in that they were not chosen to represent degraded and improved areas of the Le et al. (2014) dataset but rather areas that were most successful for conducting interviews with local stakeholders. Study sites that did not intersect with either degraded or improved pixels of the Le et al. (2014) dataset were considered to have mixed results. A benefit to this analysis is the comparison of improved or degraded areas not identified by the Le et al. (2014) dataset with the survey and other remote sensing results. Following are comparisons of the survey results with the remote sensing datasets. Figure 5.8 illustrates the eight sites chosen in India . The site with the highest agreement was Hivrebajar (3.5/4). Other sites with high agreement were Sangoha Jeur and Bayjabaiche both 3/4 agreement. In general, study sites in India showed many mixed results. The highest agreement was in Hivrebajar at 3.5/4. Unlike the previous countries, this site showed both a high level of agreement and mostly improvement. Almost all sites fluctuated between improvement and degradation, with many sites showing mixed categories. The main reason for this is that many of these sites had fluctuating agriculture between years. The MODIS land cover data showed changes within cropland but the cropland area itself was mostly static. Changes in agricultural intensity and crops grown in this area could have wide ranging effects on both the Landsat NDVI and the Le et al. (2014) data. This alone can cause discrepancies between datasets. Another issue with agreement was between the FGD results and the NDVI and MODIS land cover data. In most cases the FGD results had different results than NDVI and/or MODIS land cover, although tended to agree more with the Le et al. (2014) dataset (Table 5.10). Figure 5.9 illustrates the six sites chosen in Uzbekistan . The site with the highest agreement was Khorezm (4/4). Other sites with high agreement were Shirin KFI (3/4) and Fazli (3.5/4). Similar to Senegal the highest agreement was in areas of degradation. Khorezm showed 4/4 agreement, followed closely by Fazli, which had 3.5/4 agreement due to the FGD data being unavailable for this village. A lot of the FGD results showed mixed degradation in Uzbekistan . Similar to India, many of the villages had rotating cropland areas. Almost all sites showed a resent decrease in Landsat NDVI , much of this decrease could be due to changing agricultural practices. In many cases the MODIS land cover showed some areas being converted to agriculture while other areas nearby were reverted to natural land. This could be due to the nature of agricultural practice rather than permanent or long-term land-cover conversion (Table 5.11). Figure 5.10 illustrates the eight sites chosen in Tanzania . The sites with the highest agreement were Mazingara and Mamba (4/4). These sites also appeared to be the sites with the most degradation. Other sites with higher agreement that were mostly degraded were Sejeli, Maya Maya, Zuzu, and Dakawa (3/4). Similar to Senegal the highest agreement was in areas of degradation. Mamba and Mazingara both showed 4/4 agreement. The Le et al. (2014) dataset and the FGD results showed a near consensus. MODIS land-cover change also showed a high level of agreement. Most of the disagreement occurred with the Landsat NDVI data which showed improvement for many villages that the other datasets showed degradation. Some of the sites, such as Sejeli, Zombo, and Zuzu, that showed recent Landsat NDVI improvement, had mostly declining NDVI values from 1975 to 2000 indicating degradation (Table 5.12). Figure 5.11 illustrates the eight sites chosen in Ethiopia. The site with the highest agreement was Kawo (4/4). The rest of the sites showed mostly poor agreement at 2/4 or less. The highest agreement was in an area of degradation for the site Kawo. The rest of the sites in Ethiopia showed poor agreement at 2/4 or less. The Le et al. (2014) dataset and the FGD results showed either mixed or degradation results, however the Landsat NDVI and MODIS land-cover change datasets also showed some sites having improvement. One issue was that all of the sites except Kawo and Koka Negewo did not intersect the Le et al. (2014) data so they were given a mixed result. This was only a small part of the lower agreement between datasets since most of the sites also have confusion within the remote sensing datasets (Table 5.13). Land degradation is a growing issue as an expanding population with changing and increasing consumption patterns is placing a higher demand on the land. Properly identifying areas of degradation is vital in creating policies aimed at restoring the land. This study evaluated past efforts at identifying areas of land degradation hotspots by comparing these past results with field surveys, MODIS land-cover data, and Landsat NDVI data. This evaluation showed that, similar to the global analysis of GIMMS NDVI and Landsat NDVI, the final Le et al. (2014) dataset displayed intermediate agreement with the field results. Many of the same problems identified in the GLADIS field evaluation in South Africa persist in the Le et al. (2014) dataset. Discrepancies relating to processes that are unobservable using remote sensing, such as erosion and salinization, pervaded the sample sites. Dynamic farming landscapes posed an additional challenge to the NDVI and land-cover change analyses, particularly the practice of following fields and planting permanent tree crops. Finally, the coarse resolution of the global dataset was unable to disentangle coexisting processes of improvement and degradation from one-another on spatial scales finer than ~8 km. Additional discrepancies exist, such as the data resolution gap between each of the data sets (8 km2 AVHRR, 1 km2 MODIS , and the 30 m2 Landsat data). Also, although land-cover change is a good indicator of land degradation , it is not directly comparable with changes in NDVI. It can be difficult to identify whether deforestation or conversion of shrubland to cropland , will lead to land degradation in the future. Land degradation is a creeping process, often taking many years to manifest in issues such as soil fertility loss and erosion. The Le et al. (2014) dataset makes considerable progress in that it corrects for systematic problems associated with using NDVI alone as an indicator of land degradation, and addresses the issue of atmospheric fertilization and NDVI saturation. However, the dataset does not identify or treat differently areas of forest management or other temporary land-cover/land-use changes that may not be associated with land degradation. The Le et al. (2014) dataset was developed with the intent of identifying “hot spots” of land degradation , and further progress is needed before global maps may be used as a proxy for land degradation. Bicheron, P., Defourny, P., Brockmann, C., Schouten, L., Vancutsem, C., & Huc, M., et al. (2008). GLOBCOVER: Products description and validation report. http://due.esrin.esa.int/globcover/LandCover_V2.2/GLOBCOVER_Products_Description_Validation_Report_I2.1.pdf. ESA Globcover Project, led by MEDIAS-France/POSTEL. Center for International Earth Science Information Network (CIESIN), Centro Internacional de Agricultura Tropical (CIAT). (2005). Gridded population of the world version 3 (GPWv3): Population density grids. http://sedac.ciesin.columbia.edu/gpw (Accessed on May 01 2013). Socio-economic Data and Applications Center (SEDAC), Columbia University, Palisades, NY. Jones, P., & Harris, I. (2008). CRU Time-Series (TS) high resolution gridded datasets. http://badc.nerc.ac.uk/view/badc.nerc.ac.uk__ATOM__dataent_1256223773328276 (Accessed on May 01 2013). NCAS British Atmospheric Data Centre Climate Research Unit (CRU), University of East Anglia. JRC. (2003). Global Land Cover 2000 database. European Commission, Joint Research Centre. Available at http://www-gem.jrc.it/glc2000. Trabucco, A., & Zomer, R. J. (2009). Global Aridity Index (Global-Aridity) and Global Potential Evapo-Transpiration (Global-PET) Geospatial Database. CGIAR Consortium for Spatial Information, CGIAR-CSI GeoPortal http://www.csi.cgiar.org. Xiao, Z., Liang, S,. Wang, J,. et al. (2013). Use of General Regression Neural Networks for Generating the GLASS Leaf Area Index Product from Time Series MODIS Surface Reflectance. IEEE Transactions on Geoscience and Remote Sensing, doi: 10.1109/TGRS.2013.2237780.